The city of Cleveland Water Department provides water to 79 different communities in Northeast Ohio. Lakewood is one of them. 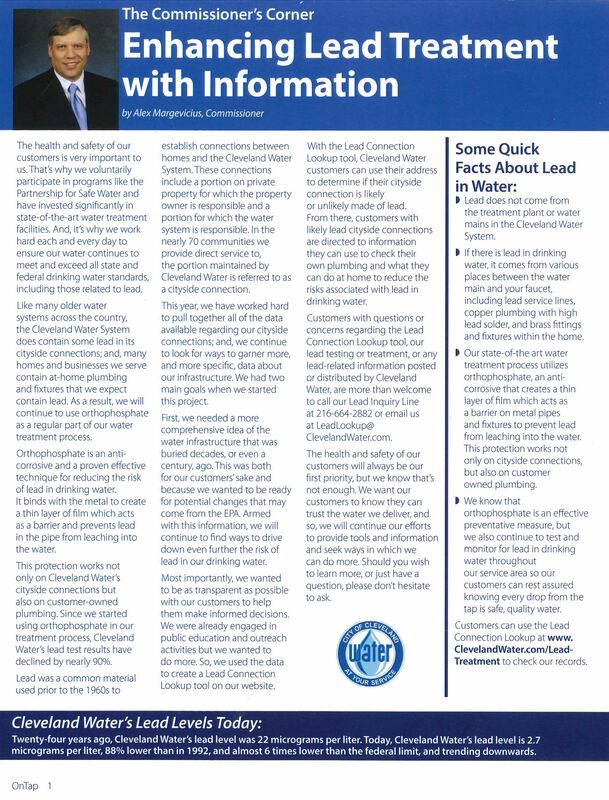 In an effort to reassure residents about the safety of our drinking water, Cleveland Water Commissioner Alex Margevicius issued a statement, outlining the processes the department uses to treat the lead in the drinking water. In addition to heavily investing in state-of-the-art facilities, the department continues to treat the water with orthophosphate, an anti-corrosive and proven effective technique for reducing the risk of lead in the water. Twenty-five years ago, Cleveland Water’s lead level was 22 micrograms per liter. To put that in perspective, today Cleveland Water’s lead level is 2.7 micrograms per liter. That’s 88 percent lover than it was in 1992 and nearly six times lower than the federal limit. To see the Commissioner Margevicius’ entire letter, click here. To learn more about Lakewood’s drinking water, click here.